Aszure Barton’s enchanted world entices with simple fascination and you leave it with a sense of melancholic satisfaction. 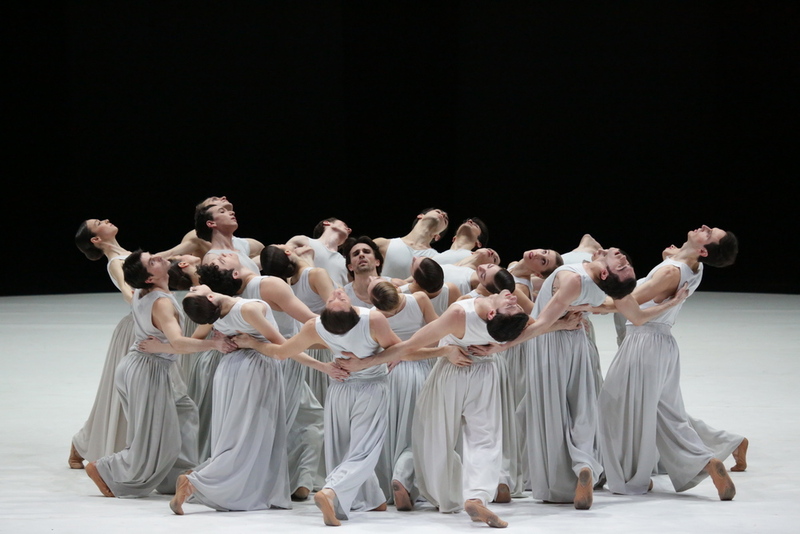 Aszure Barton has created a gem of a ballet for Milan’s Teatro alla Scala. Mahler 10 uses the first movement of Gustav Mahler’s unfinished Tenth Symphony and above it, Barton fashions a small world with a community of people who play, cry and love with directness and simplicity. Although the music is Mahler’s, the atmosphere is certainly not European, evoking the open spaces of North America, or maybe Russia: Seven Brides for Seven Brothers meets The Cherry Orchard? Reviewing the premiere of Jerome Robbins’ Dances at a Gathering (also set to European music yet infused with American expansiveness) critic Clive Barnes for The New York Times wrote that it was “as honest as breathing”. Barton is truly honest. She doesn’t do fancy, prefering to communicate clearly and openly. 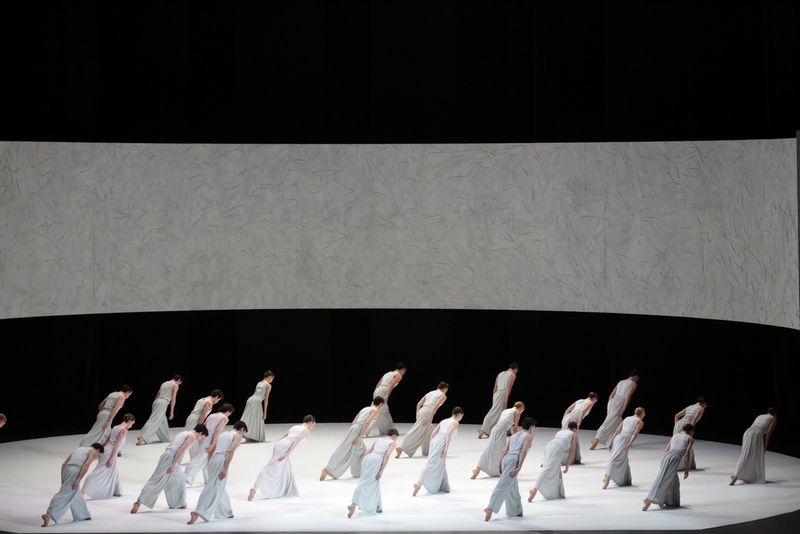 A white circular dance floor occupies La Scala’s large stage, and around the wings and backdrop hovers a semi-circular panel, similar to a Seven Brides for Seven Brothers cinemascope screen, in effect. From beneath this, dancers burst into the performance space — no one wanders, they all have something to say. At one point three of the men rush on, like the On The Town sailors, so eager to be alive and bursting to leap and turn. And how they turn. Turns of every imaginable kind – in fact, circularity, like the set, is the work’s dominant theme. Dancers come together to form Busby Berkley-like flower patterns, they slowly rotate their hips, they trace circles around themselves while sitting on the floor – it creates an impression of unending movement, of flow, a brook which eddies and purls around the stones. Barton’s movements complement the music, adding a layer above it by not attempting to mimic its phrases and dynamics. Although there are some complex passages of choreography with brilliant footwork and intricate lifts, nothing is affected or uncalled-for. Barton is a master at marshalling groups, and her power in Mahler 10 is to use her 26 dancers to maximum effect by having them do the simplest actions as one — just slowly rising to half-pointe, gently swaying, rushing from one point to another on the stage like a flight of doves, and merely laying sparsed across the stage. Antonino Sutera is Mahler 10’s central figure, and Barton manages to tap into this virtuoso dancer’s deeper well of emotion, for his sometimes fixed, if charming, smile can become a security blanket and mask what he can really express. He was excellently supported by featured dancers Claudio Coviello, newly nominated Principal Dancer Virna Toppi, Antonella Albano, Stefania Ballone, Christian Fagetti, Federico Fresi and Chiara Fiandra, who worked convincingly as dancing actors, never less than thoroughly engaged. Burke Brown’s eloquent scenery is matched by his subtly shifting lighting, caressing the dancers throughout, and contributing to Mahler 10’s simple, memorable and emotional closing moments. Aszure Barton’s enchanted world entices with simple fascination and you leave it with a sense of melancholic satisfaction.